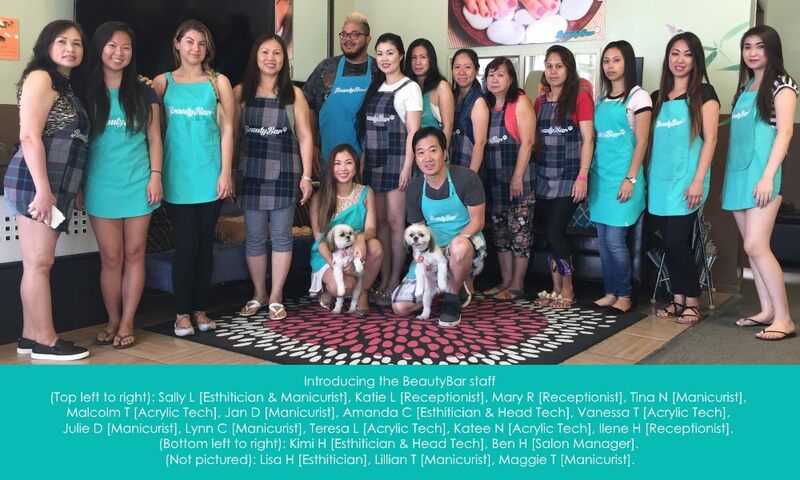 BeautyBar SGV offers a wide variety of professional pampering services to make you look and feel beautiful including nails services, facial skin care, and waxing. However, we believe the best service we offer is our 5-star customer service & quality of work. Our salon provides more personalized service than other nail salons. We take the proper amount of time to perform each service so if you need your services rushed, we are not the salon for you. We are very proud of our talented staff of artists, with a combined 133 years of experience, who can create any nails and/or designs your heart desires. BeautyBar SGV features an inviting & spacious salon that includes 3 private rooms for facials and waxing using only the highest quality products. The salon also includes over 1000 sq/ft of space dedicated to nail care with a polish station featuring over 600 regular polish colors and over 900 gel polish colors. We also serve complimentary coffee, hot tea, hot chocolate, orange juice, red or white wine, & Mimosas everyday! Whether you're looking for a quick refresh or an extensive and relaxing pampering, we are committed to every client feeling confident leaving the salon looking and feeling beautiful. To book an appointment, please call us or register below. Once you have set up an online account, you can also track your services history, future appointments, and rewards points. Thank you for choosing BeautyBar SGV! Nails trimmed and shaped, cuticles gently groomed, and a relaxing massage. Finished with a natural buff or polish. Spa chair foot soak, exfoliation, nails trimmed and shaped, cuticles groomed, and a relaxing massage. Finished with a natural buff or polish. Nails trimmed and shaped, cuticles gently groomed, sugar scrub, green tea mask, hot towel treatment, and a 10 min massage. Finished with a natural buff or polish. Spa chair foot soak, exfoliation, nails trimmed and shaped, cuticles groomed, sugar scrub, green tea mask, callus treatment, hot towel treatment, and a 10 min massage. Finished with a natural buff or polish. Nails trimmed and shaped, extended exfoliation, sugar scrub, green tea mask, paraffin treatment, hot stones treatment, hot towel treatment, and a 10 min massage. Finished with a natural buff or polish. Spa chair foot soak in aromatic soft translucent spa jelly, extended exfoliation, nails trimmed and shaped, sugar scrub, green tea mask, paraffin treatment, hot stones treatment, hot towel treatment, and a 10 min massage. Finished with a natural buff or polish. Artificial nails created with extended nail tips and applied with acrylic powder. Finished with regular polish or gel polish. Full set without tips is available at an additional cost. Artificial nails created with extended nail tips and applied with Gelish PolyGel. Finished with regular polish or gel polish. Full set without tips is available at an additional cost. Artificial nails created with extended nail tips and applied with dipping powder. Finished with regular polish or gel polish. Full set without tips is available at an additional cost. Deep pore cleansing, extended exfoliation, extractions, ozone steam treatment, and relaxing shoulder, neck & facial massage. Finished with blended purifying mask, hot towel treatment, toner, & moisturizer. Deep pore cleansing, complete exfoliation, extended extractions, ozone steam treatment, and relaxing shoulder, neck & facial massage. Finished with blended purifying mask, hot towel treatment, toner, & moisturizer. Focused on extractions and blemishes. Deep pore cleansing, complete exfoliation, extractions, ozone steam treatment, and relaxing back, shoulder, neck & facial massage. Finished with blended purifying mask, hot towel treatment, toner, & moisturizer. Deep pore clay cleansing, extended exfoliation, manual extractions, ozone steam treatment, hot stones treatment and extended back, shoulder, neck & facial massage. Finished with blended purifying mask, hot towel treatment, toner, & moisturizer.